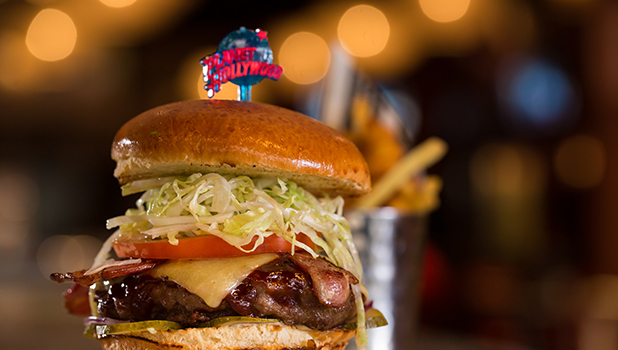 Eat, drink and feel famous at Planet Hollywood London, central London’s must experience restaurant. Enjoy a unique dining experience inspired by the glamour of Hollywood, with movie memorabilia on display throughout the restaurant plus a merchandise boutique. Conveniently located in the heart of the bright lights of Piccadilly and just moments away from the floating street artists at Trafalgar Square and just moments away from Hamleys (probably) the best toy store in the World and also M&M World. So what makes Planet Hollywood so family friendly? Of course, there’s delicious food. And then there are the huge multi-purpose TV screens which flip between cartoons, movies, music videos, diner greeting messages and LIVE transmissions of guests caught by our roving camera. Seriously, where else can you justify watching telly whilst you eat? For little ones, there is always a ready supply of crayons and colouring-in sheets but often, they’re equally entertained by the brilliant serving team who enthusiastically and skilfully engage with all the diners, whether they be young and old, or shy or outgoing. Whether pre-or-post theatre, part of a London sightseeing itinerary, dinner with family, or friends, in fact, whatever the occasion, Planet Hollywood guarantees unrivalled, delicious, affordable and hassle-free family dining. Bookings are subject to availability and strongly recommended especially during school holidays - check before travelling - tel 020 7287 1000 quoting 'National Rail'. This offer is only available at Planet Hollywood London and is subject to availability. Offer not valid 25 and 31 December.